Worksheet on numbers from 500 to 599 will help us to practice the numbers from 500 to 599 in orders. (i) Count by twos from 560 to 580. 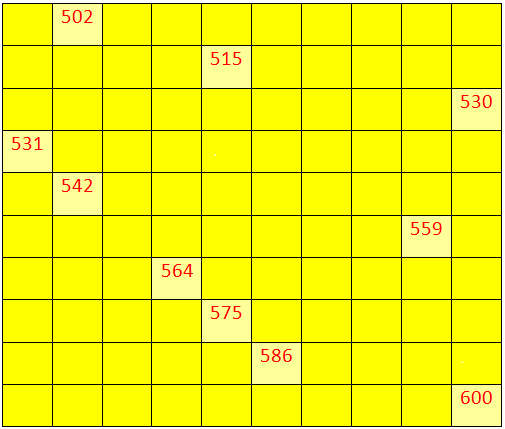 (ii) Count by threes from 561 to 589. (iii) Count by fives from 540 to 590. (iv) Count by tens from 530 to 570. (v) From 505 take away 502 and multiply the answer by 2. (vi) From 586 take away 579 and multiply the answer by 5. (vii) From 597 take away the sum of 39 and 19. (viii) From 500 times 1 take away 25. (ix) Subtract 553 from 561, and multiply the difference by 50. (i) 523, 525, 527, ____, 531, ____, ____, ____. (iii) 590, 580, 570, ____, ____, 540, ____, ____. (iv) 559, 564, 569, 574, ____, ____, 589, ____. (v) 518, 538, 558, ____, ____. 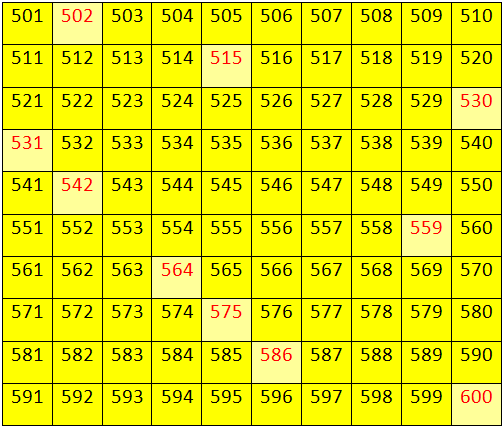 Answers for the worksheet on numbers from 500 to 599 are given below to check the exact answers. 3. (i) 560, 562, 564, 566, 568, 570, 572, 574, 576, 578 and 580. (ii) 561, 564, 567, 570, 573, 576, 579, 582, 585 and 588. (iii) 540, 545, 550, 555, 560, 565, 570, 575, 580, 585 and 590. (iv) 530, 540, 550, 560 and 570.